LDPAC is a method for detecting spurious associations using p-values. The strength of the method is its simplicity; it requires no other information but p-values. We provide both the Web server where user can upload p-values, and the Software binary. Our method uses internally stored HapMap Phase III data to retrieve LD information. Quick check: just drop 100 p-values around a suspicious association into our web server. You can instantly check if the association is spurious. Genome-wide check: since LDPAC is so fast, you can put whole genome p-values into one file and check spurious associations in hours of time. Resque: our method can detect possibly true associations from discarded associations by QC, if QC was too harsh. The intuition is that if the association is caused by a true genetic effect, neighboring markers in LD should show comparably significant p-values (Figure A). If not, it may be evidence of spurious association (Figure B). Previous studies have applied the same idea but only manually without a formal statistical framework. Our method LDPAC provides a systematic framework to quantitatively measure the evidence of spurious associations. We take WTCCC CAD chr 9 data where a confirmed association exists. We put 5 spurious associations back into the data which were originally excluded by QC in WTCCC study. 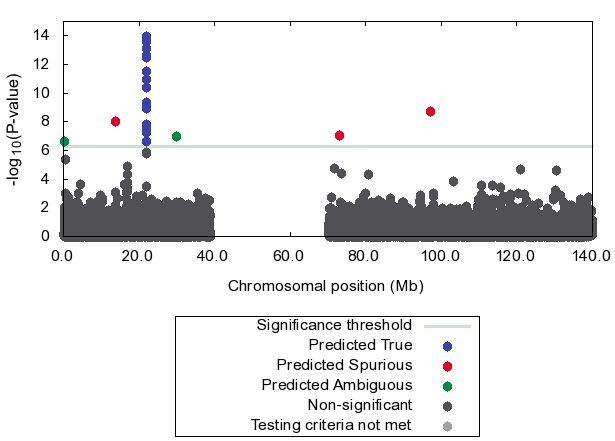 Figure shows that our method effectively detects 3 out of 5 spurious associations (red dots) using only p-values. The true association is correctly predicted as true (blue dots). 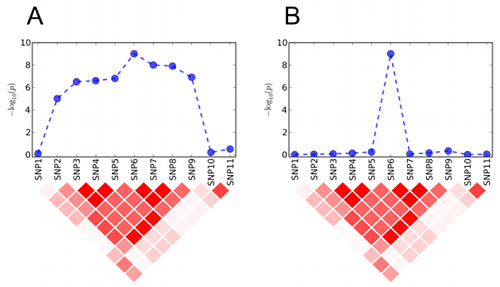 Postassociation cleaning using linkage disequilibrium information. Buhm Han, Brian Hackel, Eleazar Eskin. Genetic Epidemiology (2011) 35: 1–10. B.H. and E.E. are supported by National Science Foundation grants 0513612, 0731455, 0729049 and 0916676, and NIH grants K25-HL080079 and U01-DA024417. B.H. is supported by the Samsung Scholar- ship. This research was supported in part by the University of California, Los Angeles subcontract of contract N01-ES-45530 from the National Toxicology Program and National Institute of Environmental Health Sciences to Perlegen Sciences.